Last year, I wrote a guide to getting a vegan flu shot (in the US), covering the science, and some of the reasons why flu shots, and recombinant flu shots in particular, are a good idea. The science hasn’t changed much since then, but vegan flu shots are a bit easier to find. 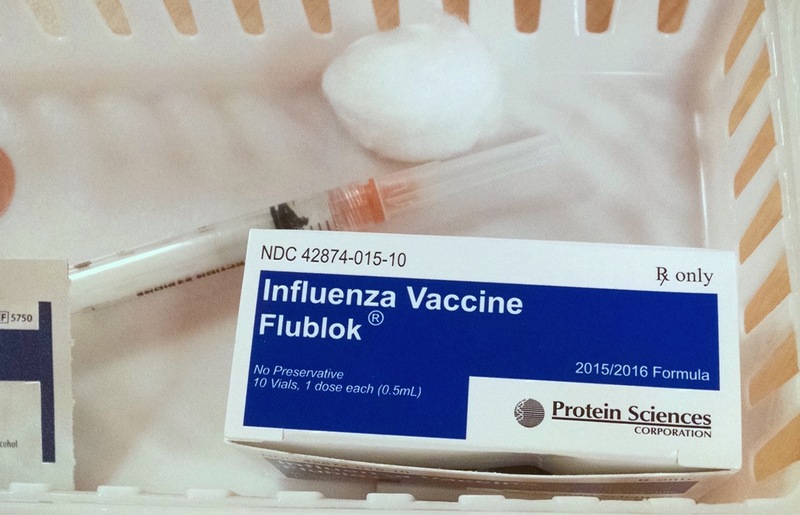 This update covers getting FluBlok, the recombinant flu vaccine approved in the US, in 2015. FluBlok is a flu vaccine produced using recombinant genetic techniques to grow virus with coat proteins from the flu virus in cultured insect cells, instead of in chicken eggs. This produces a flu vaccine without animal ingredients, compared to conventional flu shots, which take about an egg per dose of vaccine to produce. The science is covered in a bit more detail last year’s guide. FluBlok is approved in the US for adults over 18 years old. Only conventional flu shots are currently approved for children. Target Pharmacies – The biggest change from last year may be that Target pharmacies now carry FluBlok. No appointment necessary, but it may be wise to call ahead. I had no trouble getting a FluBlok flu shot at a Target Pharmacy, but they indicated that they only had a few doses left. They take insurance, otherwise the vaccine costs around $30. Even pharmacies that carry FluBlok may not know it by that name. If the pharmacy you contact hasn’t heard of Flublok, try asking for the “recombinant” or “egg-free” vaccine. If you’re not sure, you can always ask your pharmacist what the manufacturer of their vaccine options is. You may be asked multiple times if you have an egg allergy, since that is the common reason for requesting FluBlok (or the “egg-free” flu shot, as it is often referred to). You can answer truthfully, even if they ask repeatedly. They are very likely simply trying to make sure you filled out the paperwork correctly, and that you did not misunderstand the form. They are probably not trying to pressure you out of that vaccine type, even if it may seem that way. As far as I’m aware, anyone can request FluBlok. Most insurance plans will cover it regardless of egg allergy status, and it’s only around $30 if you pay for it yourself. I’ve focused on FluBlok, since I think it’s an interesting technology, however Flucelvax is also a technology worth supporting. Flucelvax is another vaccine grown in vitro in cell cultures, rather than in eggs, for production. Flucelvax uses virus samples delivered from the CDC in chicken eggs, but does not use eggs in its manufacturing process, so the process has a tiny, but nonzero egg footprint. A lot of medicine is not entirely vegan. I do not recommend avoiding medicine, especially medicine with serious public health implications such as vaccines, regardless of animal product content. For instance, I recommend conventional flu shots when recombinant flu shots are not available (including for children, for whom alternatives are not yet approved). However sometimes we have the opportunity to help push medicine forward — toward biotechnology and away from animal products. Flu shots are currently such an opportunity, and vegans should embrace and advocate for recombinant flu shots. In addition to reducing animal use, these technologies could overcome weaknesses in the conventional egg-based process — vulnerability to changes in egg supply, long delay to ramp up production, slow response to virus mutation, inability to respond quickly to an outbreak, and losing vaccine efficacy in “reassortment” process that adapts the virus to growing in eggs. Recombinant flu shots also demonstrate why I would like vegans to be open to biotechnology. Recombinant genetic techniques gave us insulin for diabetics without needing to take it from slaughtered animals. Current research projects may give us DHA (an omega-3 fatty acid not found in plants) in canola oil, B12 in plant foods, and even dairy made from yeast. Opposing biotechnology and delaying these projects could do real harm to animals. One of the ways that we will reduce our use of animals is by using biotechnology to replace animal products in medicine and food. We should be open to this technology as a community, and should support biotech projects that reduce animal use. This entry was posted in Uncategorized on October 24, 2015 by Ed Pizzi. I’ve posted previously about making vegan butter from Mattie’s excellent recipe at veganbaking.net. Since my previous post, I’ve made butter a few more times, and made a few small changes. Mattie’s butter recipe at Vegan Baking is the best vegan butter recipe that I’ve come across. I love how it replicates the chemistry of dairy butter, rather than simply imitating its flavors. It uses curdled soy milk solids as a flavor base, and uses a mix of coconut oil (for solid / saturated fat) and vegetable oil as the fat. This recipe captures the flavor and texture of butter much more realistically than any butter alternative that I’ve tried. 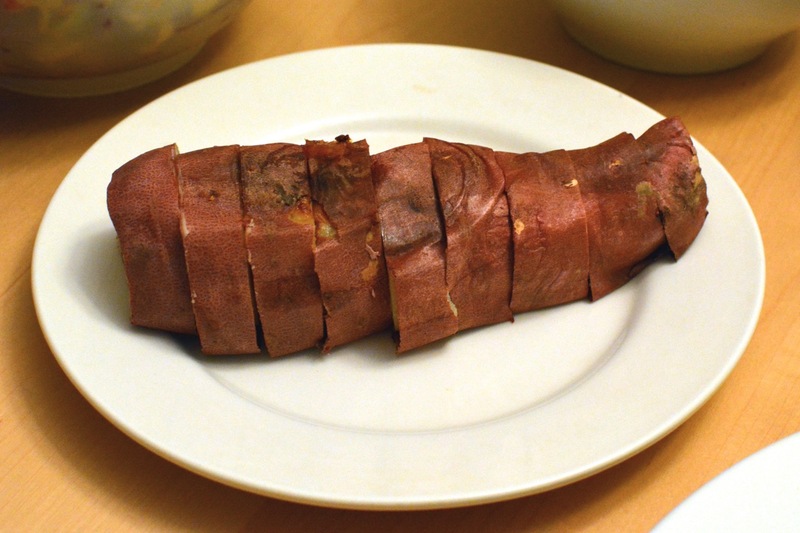 It has a complex flavor, and could stand up to high cuisine in a way that Earth Balance could not. This recipe is still the basis for the vegan butter we’ll be making, with a few small adjustments. After making this a few times, I noticed that sometimes this would make incredible butter, whereas other times it was more pedestrian. I also noticed that sometimes the soy milk curdles in an obvious way, and other times it only curdles subtly. This led me to realize the importance of the choice of soy milk to use for making butter. There are essentially two types of soy milk that I buy, or that I’ve seen in stores. There is general-purpose soy milk, which is usually fortified (extra calcium, vitamin B12, and usually vitamin D), and has stabilizers, such as carrageenan and xanthan gum, which keeps it from curdling in coffee, for instance. The alternative is basic soy milk, with only soybeans and water as ingredients. In general, I think fortified / stabilized soy milk is a better choice nutritionally, since calcium, D and B12 are important in vegan diets. However for butter, as well as baked goods that require curdling soy milk, you want the basic soy beans and water style soy milk (such as this). You’ll also want the plain, unsweetened / non-vanilla kind, to avoid flavoring your butter. Since I use both types for different purposes, I usually have two types of milk at home: everyday-use fortified soy milk, and basic soy milk for making butter, yogurt, baking. Curdling is important in giving vegan butter characteristic butter flavors, so choose a soy milk that curdles. I’ve also found the choice of vinegar to be important in making vegan butter. The Vegan Baking recipe originally called for apple cider vinegar, and calls for a mix of apple cider vinegar and coconut vinegar, which I have yet to find in a store. The main issue I had with the Vegan Baking recipe is the strength of the apple cider vinegar taste. Apple cider vinegar adds a sour fruity note to the butter, which contributes an important buttery flavor. However it is also a very strong flavor, and using apple cider vinegar as the only vinegar in this recipe overwhelms the butter’s subtle flavors. The Vegan Baking article discusses this, and suggests a mix of coconut vinegar and apple cider vinegar if apple cider vinegar is too strong a taste. Since coconut vinegar is a rather unusual ingredient, I recommend mixing apple cider vinegar with something most people already have in their cupboard: white vinegar. I found that combining apple cider vinegar and white vinegar in a 1:3 ratio works very well. The original recipe makes only a cup of butter (two regular-size sticks), which isn’t a lot of butter to make in a batch, and such a small amount of butter does not blend well in a 64oz vitamix container. For these reasons, I always make double batches of the recipe and freeze sticks of butter until I need them. Prepare a level place in your freezer for your butter to cool. Chill the mold you’ll be using in the freezer, so that the butter freezes quickly. Heat coconut oil until it’s liquid, but not much warmer than room temperature. Whisk ingredients and set aside for 10 minutes to curdle. Add the butter solids to the oil mix in the blender, and blend. Once well-blended, pour into a mold. 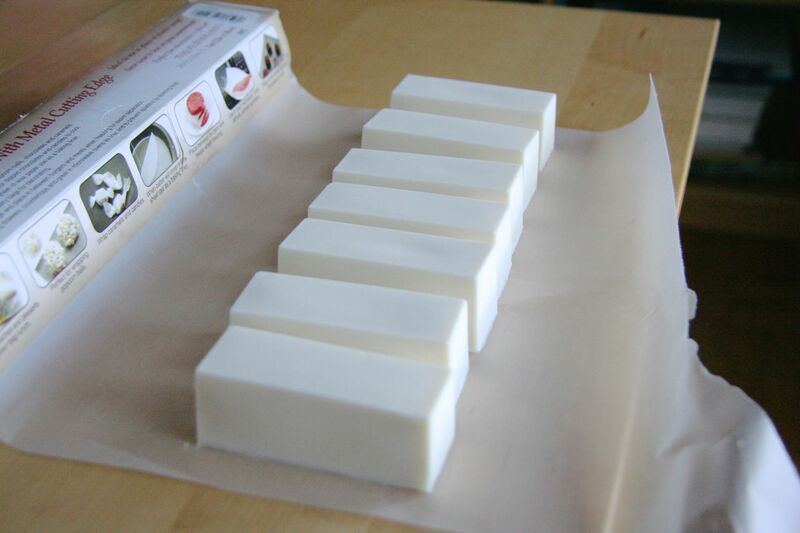 I use an Allforhome mold, which makes 1/4 cup sticks of butter (half the size of normal butter sticks). Put the mold in the freezer until the butter is frozen solid (a few hours). Keep the butter in the freezer until ready to use, then move it to the fridge. If you’re able, keep it out at room temperature before using it to spread on bread. This yields a nice spreadable texture. Vegan butter is a great staple to have on hand, and it’s gratifying to make something that is so much better than what is available in stores. This recipe has won the approval of our family’s baker, who is otherwise skeptical of vegan butter, which is high praise. I’m always open to trying different variations or improving a recipe, but to my palate, this butter is very nearly perfect. This entry was posted in Recipe and tagged Blender, butter, Food Chemistry on July 18, 2015 by Ed Pizzi. Goma-ae is my latest culinary love. It’s a sweet Japanese preparation of spinach with a sesame dressing sauce. I first encountered goma-ae at Shizen, San Francisco’s new vegan sushi restaurant (which I highly recommend), and it was an instant favorite. Spinach is incredibly nutrient-dense, especially after cooking down. Almost anyone’s diet can be improved by adding cooked spinach, so this is a great addition to any home cook’s repertoire. I haven’t tried this dish with children, but my hope is that it would be kid friendly. Goma-ae is fairly straightforward to prepare. The only real trick is not overcooking the spinach. Spinach cooks rapidly in boiling water, so you have to be quick, and then cool the spinach down in cool water to stop it from cooking further once you remove it. The use of tahini here is a bit non-traditional. Traditional recipes use a larger amount of toasted sesame seeds, and a mortar-and-pestle to grind them. This is a bit easier, and tastes delicious. Goma-ae, prepared from just over a pound (500g) of raw spinach. I based this on a recipe from Japan Centre. I substituted tahini for some of the sesame seeds based partly on my observation of the Shizen dish. (Also because don’t have a mortar and pestle.) I also reduced the soy sauce a bit to highlight the other flavors. I have a difficult time getting 1 tbsp of sugar to dissolve in 3 tbsp of liquid. The original recipe calls for 2 tbsp sugar in 3.5 tbsp of liquid, and doesn’t discuss heating to dissolve it. It actually makes me wonder if that’s not a typo. :) Maybe use agave or something if you don’t want to bother with dissolving sugar. Yields about 2 cups. Let’s call it 4 servings. Boil water in a large pot. While it’s heating up, rinse and wash the spinach. Prepare a bowl with ice water to cool the spinach after it cooks. To cook the spinach consistently, you’ll have to get it in and out quickly. I’ve been boiling the spinach in a steamer basket, which makes it easy to remove quickly. Boil the spinach just until the spinach turns a deep green. For baby spinach, this takes about 30 seconds. Fully grown spinach (which I haven’t tried) is said to take about a minute. Once the spinach is out, run it under the faucet for a few seconds to cool it down, then put it in the ice water. I had to cook the spinach in two batches to fit it all. Once the spinach has been cooked and chilled, drain it and squeeze the water out. If you’re using fully grown spinach, cut it into two-inch lengths. Dissolve the sugar into the soy sauce and mirin. I find that I have to heat the mixture up by microwaving it for 15 seconds to fully dissolve it. Once the sugar is dissolved, add the tahini and sesame seeds. If you need to toast sesame seeds, it’s easy to do and just takes a few minutes. I toast sesame seeds a few cups at a time. Put them in a sauce pan over medium heat, stirring frequently, until they become fragrant. Remove from heat, and let them cool on a tray. They can overcook if you keep them in a pan, and moisture is trapped if you put them in a jar right away. Pour the dressing over the spinach. 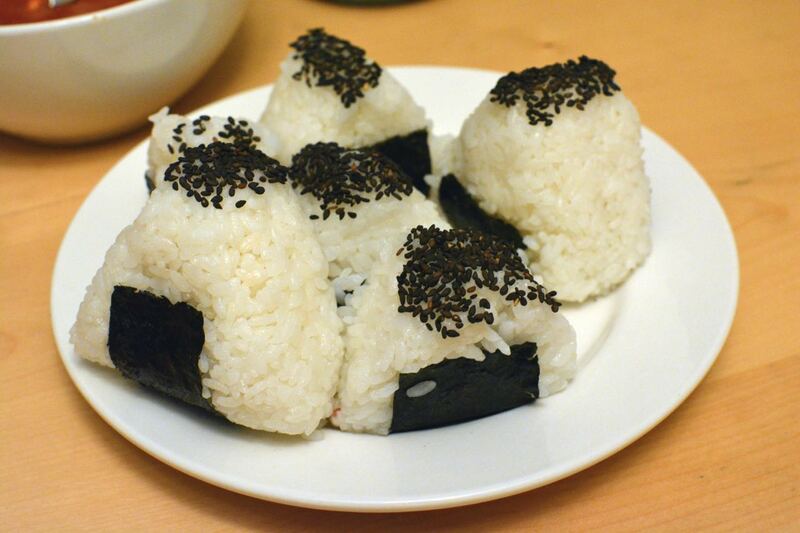 Goma-ae is best served cold, so consider putting it in the fridge for a bit before serving. 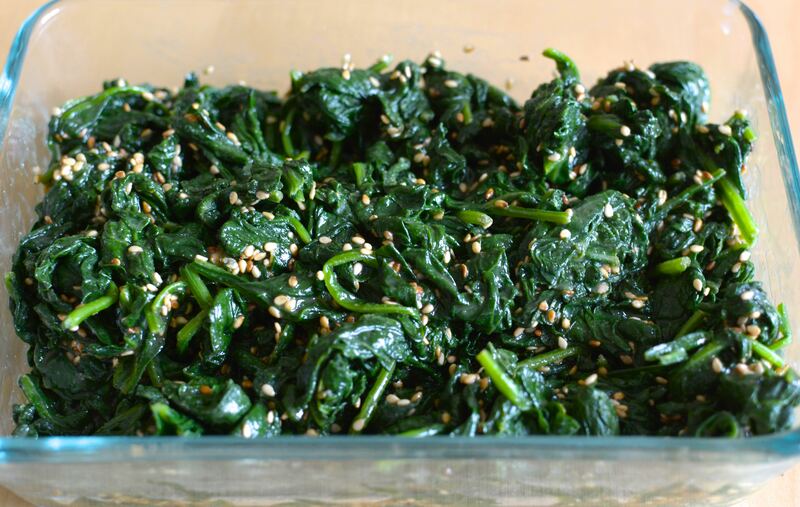 This entry was posted in Recipe and tagged Japanese, spinach on June 6, 2015 by Ed Pizzi. New science and policy blog! I’ve started a new science and policy blog at veganperspective.org. The first post discusses California’s water restrictions and why these efforts fail to consider our most significant uses of water. Check it out! This entry was posted in Uncategorized on April 3, 2015 by Ed Pizzi. My most popular post on this blog to date was an early post on the great Soy Yogurt Crisis of 2013. 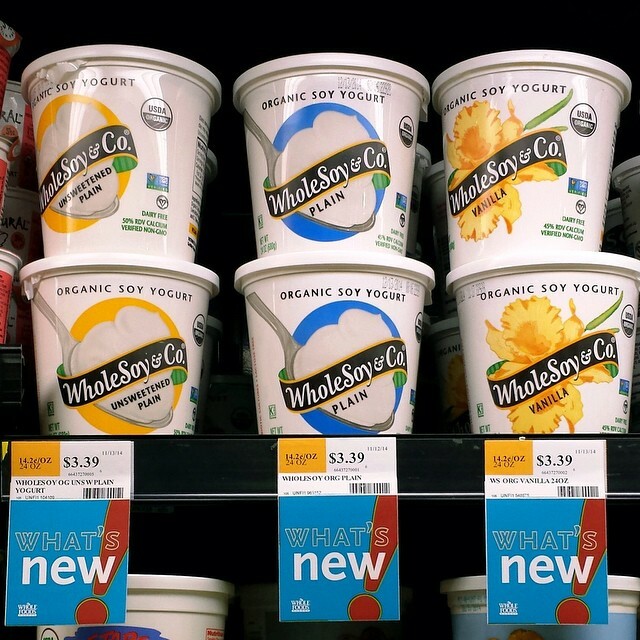 That situation was caused by a yogurt manufacturing plant used by WholeSoy & Co. (and likely Amande and Trader Joe’s) abruptly closed its doors without notice. This occurred after a period of consolidation in the soy yogurt market, leaving the US without a plain (non-fruit flavored) soy yogurt. Flavored yogurts are great, but are not appropriate for baking, for instance. Now, a year after WholeSoy & Co resumed production in March 2014, WholeSoy & Co issued an announcement yesterday stating that they can’t repay the debt they accumulated during the 2013 lapse in production, and have been forced to shut down. I’m very sorry to see WholeSoy & Co go. They were a great soy yogurt brand, and were beloved by the vegan community. I hope that someone brings a plain soy yogurt to the US market market soon to begin to fill their shoes. It’s been a while since I’ve taken inventory of the current soy yogurt offerings. In the coming weeks, I hope to look into what soy yogurts are still out there, and if any of them can stand up to what WholeSoy & Co. offered. Do you have a favorite soy yogurt that is still available (especially with a plain flavor)? This entry was posted in News and tagged soy yogurt on March 21, 2015 by Ed Pizzi. Emily and I recently had a cooking lesson with Jesse Miner, a vegan personal chef based in San Francisco. I met Jesse at one of the first vegan events I went to, and it was great to reconnect with him for a cooking class. Jesse came to our home with the ingredients we’d be cooking with, as well as equipment in case we needed it. We cooked for several hours, then had a big meal. The menu was put together by Jesse, based on our interests and culinary skill level. The lesson introduced us to several new foods, some of which were instant favorites. This was a new food to us, and they’re so good! These don’t require preparation, and can be put in the oven at 350 for about an hour, and served sliced. They keep in the refrigerator once cooked, and make a great snack, so we’ve been cooking a few at a time, and eating them throughout the week. I brought some to work in a mason jar. Depending on how much eccentricity you’re comfortable projecting, this is either a brilliant work snack, or bizarre and shameful behavior. 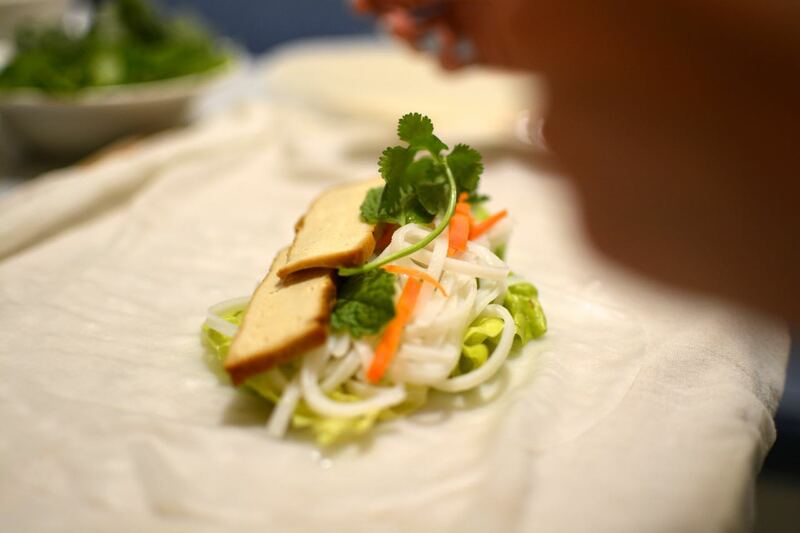 Spring rolls are a food we enjoy at restaurants but hadn’t made ourselves. If you use store-bought baked tofu, they’re pretty straightforward to make. Folding them is a bit challenging. You win some, you lose some. These are a Japanese street food. There’s a food truck in SF that sells them, which is how we’d come across them in the past. The ones we made were filled with pickled plum (umeboshi), a favorite sushi filling of Emily’s, which we’d never cooked with. They turned out great! 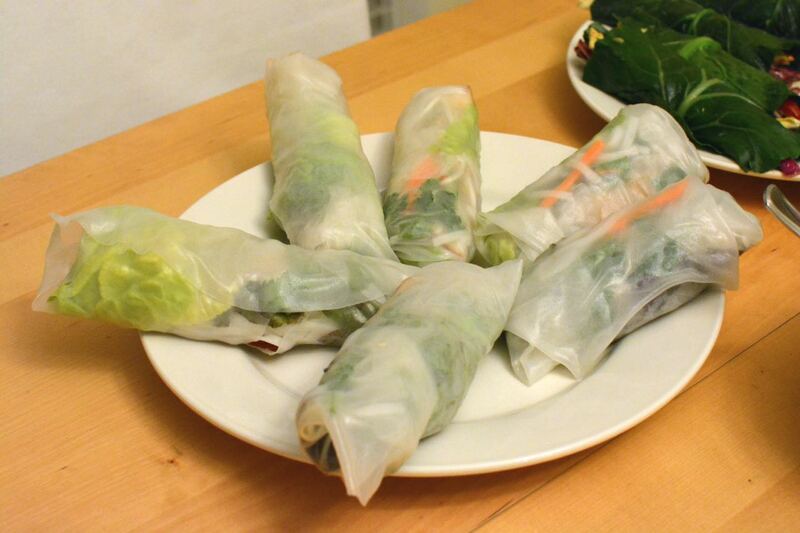 As with the spring rolls, we haven’t mastered making them geometrically consistent. This was our favorite discovery of the night. Emily and I haven’t been exposed to much Korean food, and vegan Korean food can be difficult to come by. However this was amazing. 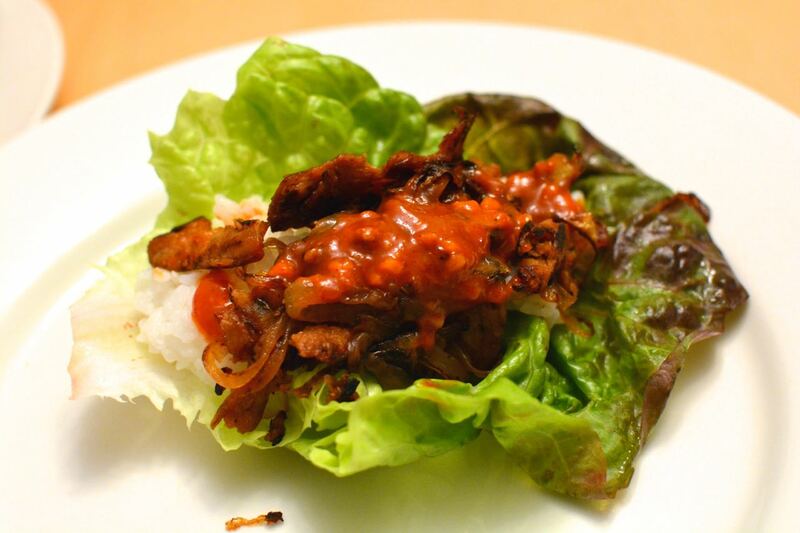 This is a lettuce wrap (ssambap) with rice, soy curls Korean barbecue (bulgogi), and a fermented hot pepper sauce (ssamjang). This wrap has so many flavors, and a few of them were new to me. I’d bought some soy curls ages ago, but I’d never cooked with them. Soy curls are a bit intimidating looking if you’ve never had them, since they are packaged dry, and don’t really look like anything before you rehydrate them. The bulgogi marinade was delicious, and the ssamjang sauce, based on gochujang, a fermented pepper paste, is a very unique flavor that I was craving the rest of the week. I plan on writing more about vegan Korean food in another post. However suffice it to say that we loved this dish, and made it twice more that week (until we ran out of soy curls). For dessert, we made haupia, a sweet Hawaiian dish. 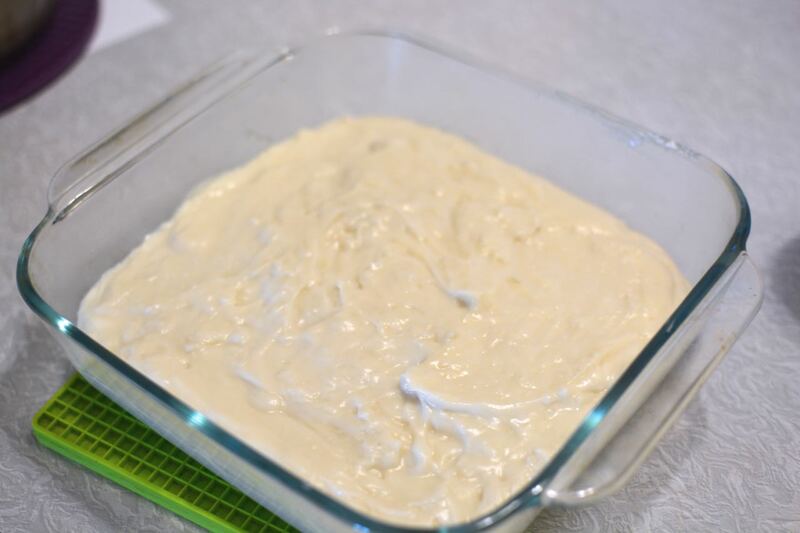 Haupia is made with coconut milk and corn starch, and results in a gel-like consistency. It’s a bit hard to describe, but it’s a unique dessert that we hadn’t come across on our recent trip to Hawaii, so we were happy to try some. 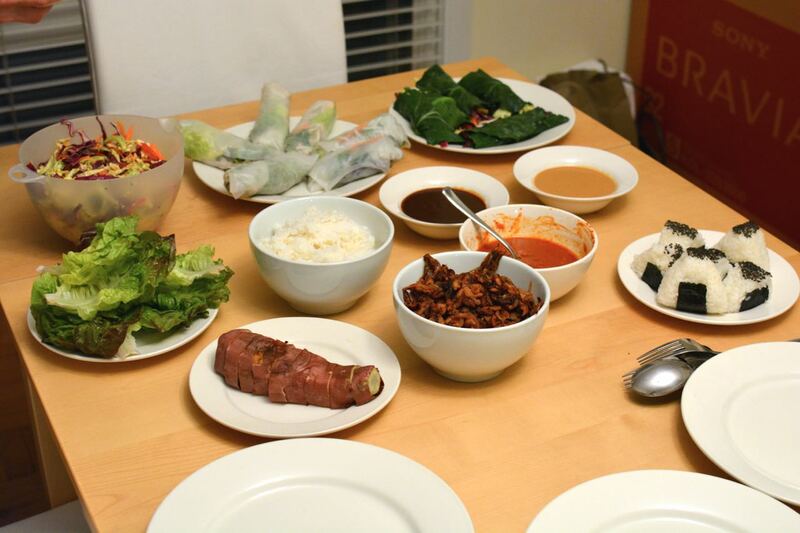 Other foods we cooked included a peanut sauce and a Vietnamese hoisin dipping sauce, a cole slaw using the peanut sauce, and collard green wraps using the cole slaw. The cooking lesson was a great experience. It was great to prepare so many foods that are very different from what we usually cook, and it was great to get outside of our comfort zone culinarily. Cooking lessons are a fun way to expand your culinary repertoire, and participate in the catering and chef businesses that are the heart and soul of the vegan food movement. I had a great time, and I hope to take more cooking lessons in the future. This entry was posted in Uncategorized on March 14, 2015 by Ed Pizzi. This is the first recipe I made with Frank’s Red Hot, and I’ve gone through bottles of the stuff on this recipe alone. It tastes like junk food without being particularly unhealthy, and is a fun way to prepare tempeh. I got this recipe from Clean Green Simple, which says you can also make this with cauliflower. I find that tempeh works well, and I like to have a protein (or high-lysine food, if you want to get technical) with every meal, so I haven’t tried the cauliflower variety. 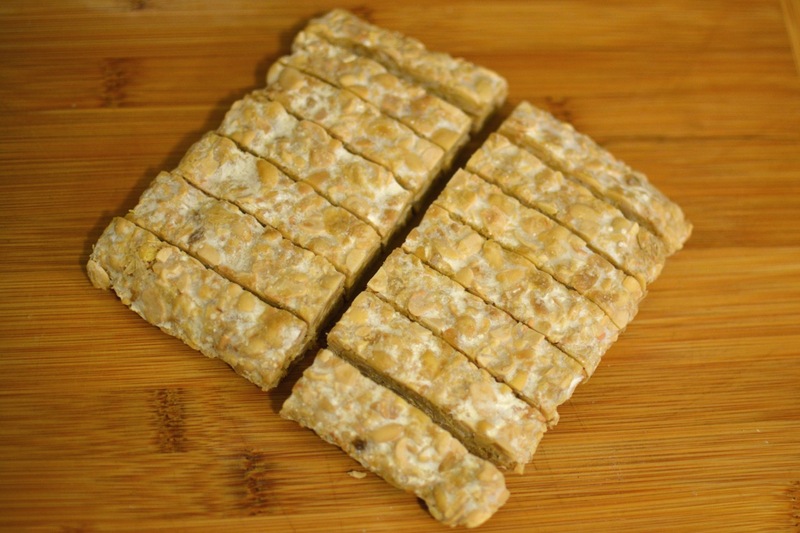 I use Rhizocali Tempeh, an Oakland-made tempeh that can be found at Rainbow. It’s distributed frozen, and keeps indefinitely in the freezer. I buy a bunch of it at a time, so that I always have protein on hand. I’m using use Frank’s Red Hot original sauce, which contains just peppers, vinegar, salt and garlic powder. They also make a buffalo wing sauce which might also be vegan, but it has “natural butter type flavor” as an ingredient, so who knows what that means. I make this recipe with less sauce and oil than the Clean Green Simple version. If you’re serving it in appetizer portions, this may not matter, but I usually eat this as an entree, split between two people. I make this pretty frequently, so reducing the oil makes it more tenable as a frequent entree. Cut the tempeh into roughly french fry shaped pieces. 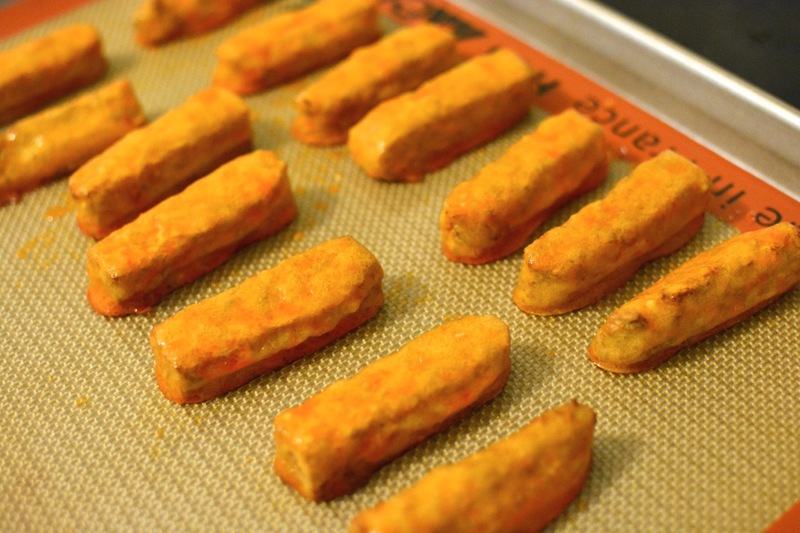 Coat the tempeh pieces in the batter, and put the battered pieces onto a non-stick baking sheet. I’ve been using a Silpat non-stick baking mat for these, although an oiled pan may also work. Let excess batter drip off so that it doesn’t form a puddle under the tempeh on the baking sheet. I find I have to go back and touch up the parts of the tempeh that I was holding, since they are otherwise missing batter. Bake at 350°F for 15 minutes, then brush them with hot sauce and oil, and bake for another 5 minutes. When brushing, I try to move them and get some of the hot sauce under them, so that the bottom isn’t too dry. Brush the tempeh with the remaining sauce, and serve immediately. Tempeh wings with steamed broccoli and pastina. One 8 oz package of tempeh. Preheat the oven to 350°F. Cut the tempeh into french fry sized pieces. 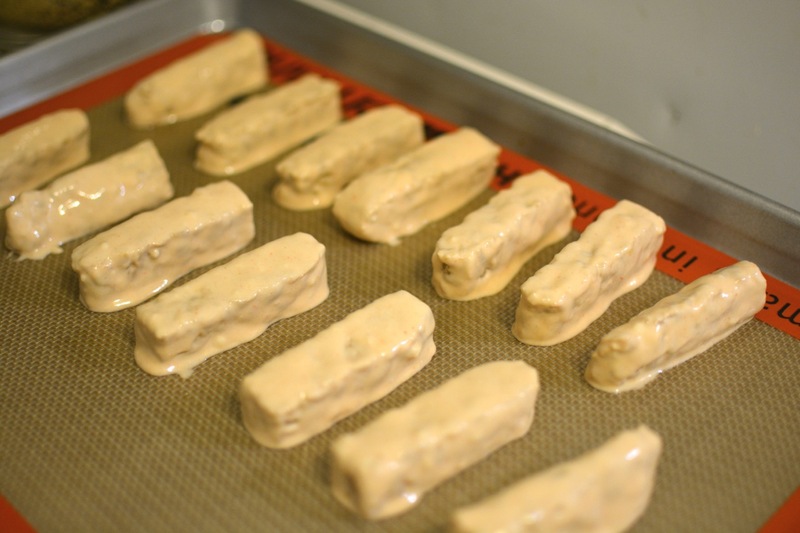 Mix the batter together, dip the tempeh pieces to coat, and put them on a non-stick baking sheet. Bake for 15 minutes. Mix the hotsauce and oil together. Brush the tempeh lightly with sauce, and bake for another 5 minutes. 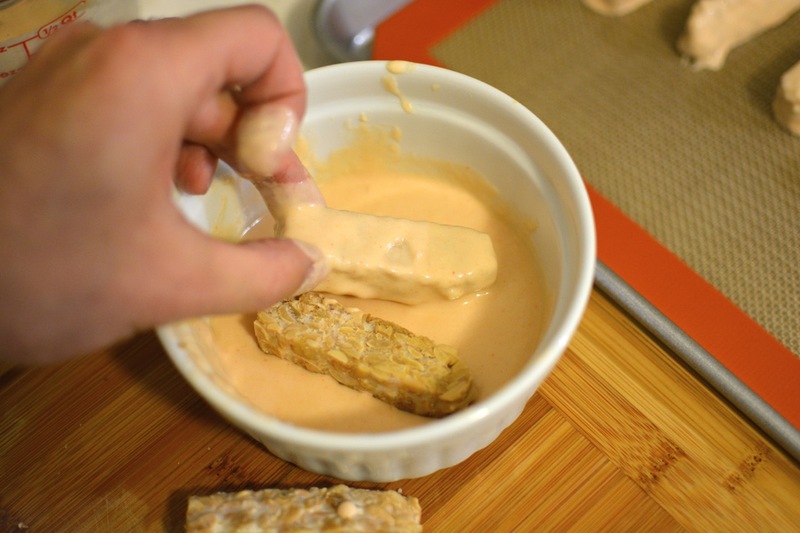 Coat the tempeh with the remaining sauce, and serve immediately. By my count, the recipe totals 843 calories (and 48g protein). If split between two people, that’d be 421 calories (and 24g protein) per person. With broccoli and rice, it’s about 670 calories (and 31g protein). If you’re dieting, you may want to reduce the rice to 1/2 cup for a total of 562 calories. My point with all of this is that junk food has its place, even in calorie-restricted diets. This is truly excellent junk food, and isn’t even particularly unhealthy. It just seems unhealthy, which is a quality to be respected and admired in reasonably healthy food. Vegans don’t have enough junk food entrees. I do my part by making this almost every week. Rhizocali Tempeh has a campaign to bring Tempeh Buffalo Bites to bars. This is a a similar recipe, using deep fried, rather than battered and baked, tempeh. I’ve had them at vegan food events, and they’re tasty! Weird Fish in SF (closing soon) has excellent vegan buffalo wings (the “buffalo girls”), that I’m assuming are made with Frank’s. 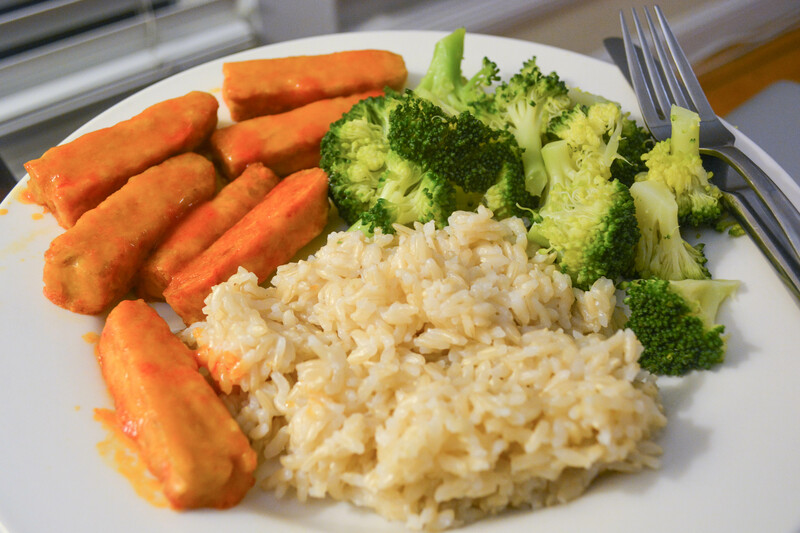 Clean Green Simple’s Vegan Buffalo “Wings” recipe. Cauliflower Buffalo Wings at vegan.com and at V-Lish. 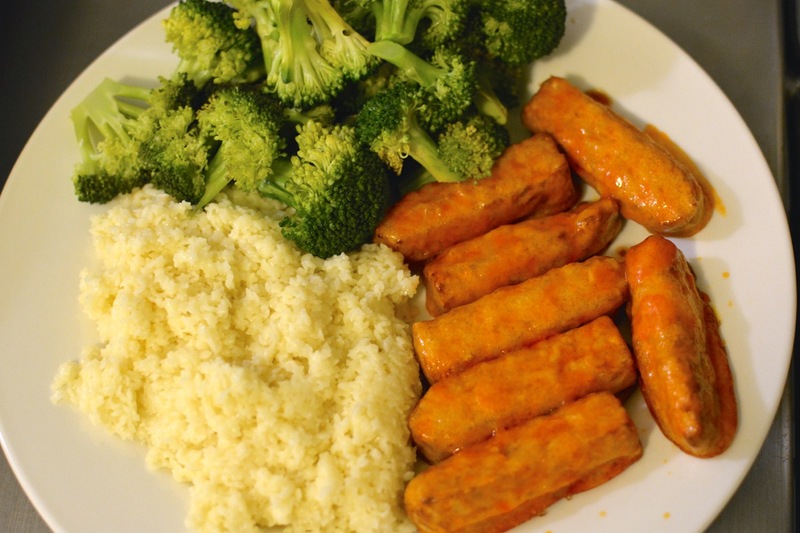 This entry was posted in Recipe and tagged Frank's Red Hot, Tempeh on February 21, 2015 by Ed Pizzi.